Michael Shawn Murray is the son of Sharon and Danny Murray of Kintore. Recruited in 1989, he trained on HMCS Saskatchewan. He took part in the Haitian Embargo on HMCS Fraser. Then on HMCS Nipigon he was part of the anti drug operation in the Caribbean. 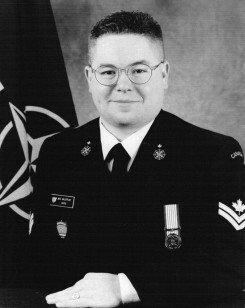 From 1993 to 1995 he served on the HMCS St. Johns as part of the European NATO Deployment. In 1996 he became an instructor at Naval Operations School. From 1997 to 1999 he was a NATO Fleet Staff Member. Part of his duties included operations during the Bosnia/Herzegovina campaign. He has been an instructor on the HMCS Montreal in the Persian Gulf and the HMCS Toronto doing Anti-Drug Operations off the coast of Somalia. He was a Naval Leadership School Instructor from 2007-2009 and from that point on he has served as an instructor. His Medals are NATO Article 5 Operation Active Endeavour Medal, South West Asia Service Medal, Canadian Forces Decoration 1 (22 years of service), Special Service Medal (over 180 days of Active NATO Service), 125th Anniversary of Canada Medal, Canadian Peace Keeping Service Medal, and the Queen’s Diamond Jubilee Medal. He retired in 2013 and lives with his family in Nova Scotia.